Promoting Ikebana as a form of art (Western art) created a great Ikebana boom after the war with tens millions of Ikebana students. However, the term "art" was problematic. Art is a Western concept introduced to Japan after the Meiji era. Although Tenshin Okakura proposed an influential definition of art, it is a bit hard to understand for the general public. In addition, since Modernism it seems that even Western specialists cannot agree on what art is. Stating that Ikebana is art means that Ikebana becomes ambiguous for the majority of Japanese people. Sofu Teshigahara insisted that Ikebana is free self-expression but that simple definition was also confusing. It's easy to see how this could cause some problems sooner or later. 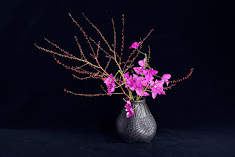 Sofu was influenced by Mirei Shigemori in establishing his ideas about Ikebana. Shigemori is the most important garden designer in the Showa period and also a significant figure in modern Ikebana history. I’ll talk about his ideas on Ikebana at some other time. The important thing at this stage of my discussion is that there were two aspects to Ikebana after the war: the general public’s view of Ikebana as a kind of training to become a good housewife, and some schools’ view of Ikebana as art. These two aspects can produce both positive and negative results. Looking at these in relation to Japanese society at the time helps us understand the current problems of Ikebana.